Despite laws prohibiting distracted driving, people are still not paying attention, which proves you can’t legislate stupid. Kelly Blue Book has released the results of a survey it conducted as part of its Distracted Driving Month campaign that show 61percent of adults still drive while distracted, which means six out of ten people aren’t paying attention to the road while driving—despite knowing all the risks. While those numbers are quite large, consider that according to distraction.gov, 46 states have bans on texting and in 41 of those states, officers can write tickets for a primary offense. In 14 states, hand held cell use is prohibited and 38 states have bans on all cell use—handheld or blue tooth—for novice drivers. 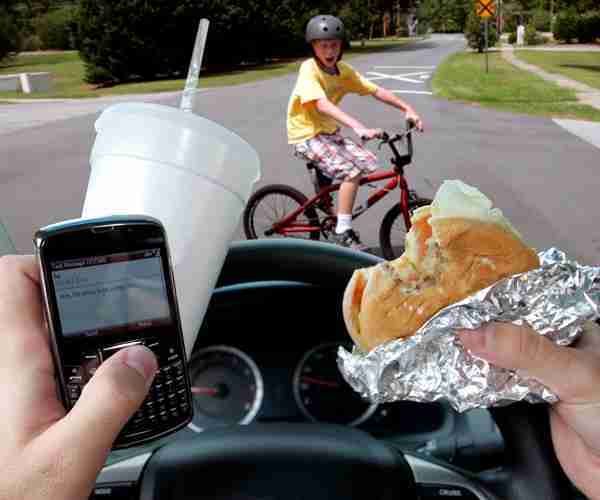 In short, laws abound but people are driving distracted anyway. So what’s the solution? If it didn’t mean lots of innocent people would get harmed, I would suggest we let distracted driving continue and let the problem solve itself via natural selection. That isn’t feasible. The knee-jerk reaction to danger is always more laws but numerous laws don’t work. Of the people surveyed 41 percent suggested police enforcement and 37 percent suggested more and stricter laws. But the survey already established that most people drive distracted despite laws. The most popular suggestion—65 percent—is an app that disables the drivers’ phones when in the vehicle. This could work. My money in the meantime is education, education, education. Real education, not awareness. The difference? Being aware means you know something exists; education means teaching someone that their actions might kill someone’s mom, dad, sister or brother. The majority of drivers are distracted.